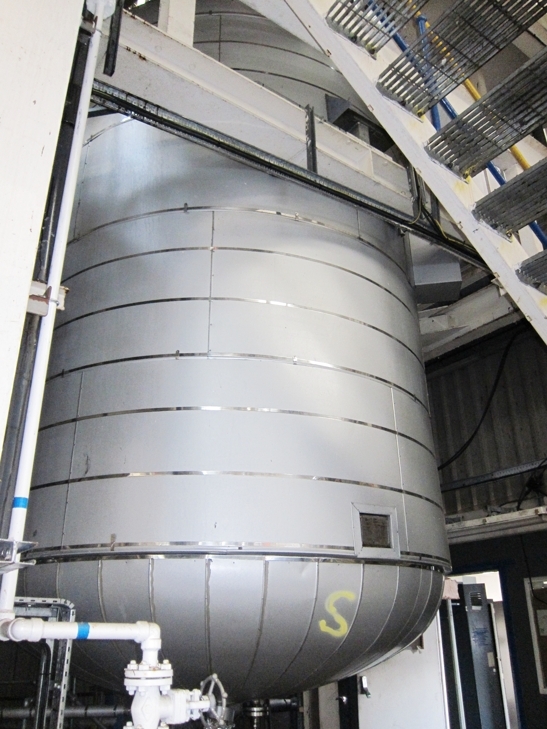 25,000 litre 321 stainless steel jacketed mixing vessel with agitator. 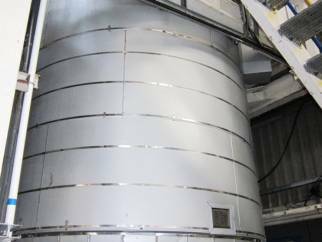 25,000 litre 321 stainless steel jacketed mixing vessel/reactor with agitator. 25m3 321 Stainless Steel Jacketed Mixing Vessel, built by RMF, 1989, dished top and bottom, 2756mm id jacket x 4000mm tan to tan, vessel design pressure 3bar, design temp 80degC, jacket design pressure 5bar FV, design temp 80degC, side supports on load cells, complete with a Lightnin Gearbox, Model 16S-3, ratio 17.3/1 reduction, 3kw 415 volt 50 Hz motor, 700rpm, 41.6 rpm on the shaft and a twin flight 3 blade turbine agitator. Unit has 3 internal baffles.